Yogi Amit has been practicing Yoga since his early teenage years, in Northen India. He completed his bachelor's degree in science and his post graduate diploma in Yoga from G.K. University, continuing to develop his knowledge in both modern science and the ancient system of Yoga. Amit has had the privilege of studying with some of India's most noted teachers such as Swami Ram Dev ji and Swami Rudra ji. He has studied at the Ashtanga Research Institute of Mysure, India with Sharath Rangaswamy, and several times at the Iyengar Institute in Pune, India. He has also studied with other western teachers such as David Swenson and Usha giving Amit a well rounded perspective of how Yoga is being taught globally. Amit has ran a Yoga studio in Rishikesh Himalayas and has taught Yoga teacher training retreats and workshops around the World. At this time Amit is offering Yoga in New York. His classes are full of uplifting energy with his genuine loving nature and good sense of humor. Alex Litvak is an honorably discharged former Infantry Marine, with service-connected disabilities which led him to seek out and explore Yoga as alternative lifestyle for healthier living. He currently holds the highest available certification from Vikasa Yoga Thailand, 500hr RYT Yoga Instructor, and is flag-bearerfor the school representing Vikasa Yoga style in the USA. The word Vikasa means Evolution, and so the style is a hybrid of many classical Yoga, emphasizing most effective techniques for customizing a personal practice – the way Yoga is truly intended. Furthermore, Alex also holds another 200hr RYT certification from a popular New York based studio ‘Yoga to The People’. Alex studies and practices Yoga independently daily, and when he can find time, seeks out the best available teachers to continue honing his skill-set. Alex studies with Master Kosta Miachin in Koh Samui, Thailand, Nevine Michaan the founder of Katonah Yoga, and Jared McCann,Yoga World Champion, and is majorly influenced by the philosophy and life of Jeet Kun Do founder and Legendary martial artist Bruce Lee. Currently, Alex is finishing up the last year of a Master’s degree in Psychology, with concentration in Spirituality and Mind/Body practices from Teachers College, Columbia University. Alex says he is excited to teach at Sakshi Bhava Yoga studio because Amit represents the true Yogis from the foothills of the Himalayas, and is a great source of knowledge, wisdom and personal insight on Yoga as art of living. Iuliia Rudenko-Golden was born and raised in Mariupol, Ukraine. Iuliia's love for movement began at an early age as a highly ranked Judo martial artist, and avid circus artist. In 2009, Iuliia's was first introduced to Yoga by her mom Lidia. The year of 2011 fulfilled one of her dreams by moving to the Big Apple! As soon as she landed, Iuliia started to deepen her yoga practice studying at Laughing Lotus, Jivamukti, and Yoga Vida. Iuliia was so inspired by the yoga practice she wanted to get a closer look. Iuliia spent a few months in India (Spring 2016) where she traveled from New Delhi to Agra, Varanasi, Goa, and ending in Mysore. Iuliia studied from dusk till dawn daily at "Ashtanga Yoga Mysore," where she completed her RYT 200 Hour Teacher training program. Since Iuliia's graduation she has been partnering up with yoga mentor Amanda Valdes for events and has been assisting yoga classes for AV-Studios. Ilulia's classes are synced with specific and thoughtful sequencing and bumping playlists. Erzhena’s devotion to yoga began through the advice of a friend before she moved to New York 4 years ago. Her friend championed the idea of living with yoga as a base for a healthy lifestyle. Erzhena started with a book of B.K.S. Iyengar “Light on Yoga” which helped her to begin the journey. Then she decided to learn more profoundly about the philosophy of Yoga in the Integral Institute of Yoga, where she got her yoga teacher certification. Now four years later it has enveloped her, becoming the core of how she lives on a daily basis. Her whole life changed from the moment that she discovered the rich benefits of the ancient spiritual science of Yoga. It not only transformed her physical body, but also altered her way of thinking and her own philosophy that she lives by. Yoga has allowed her to find that balance and establish a stronger connection with herself, learning to grow through the emptiness. It brought her to find whole new levels within herself. Yoga helped her to realize that it is very important to follow our heart, our intuition to find our true Self. And this is what she did by following her intuition to pursue her dream and get her Master degree in Acupuncture and Oriental Medicine at the Pacific College of Oriental Medicine. She wants to help people to live healthy and mindful life. Yoga’s life changing system gives her guidance in maintaining a grateful heart. Elena came to Yoga 16 years ago. Yoga came to her many years later. " The mind can reach the state of Yoga through practice and detachment (Yoga Sutra of Patanjali 1.12 translation TKV Desikachav) Yoga is a journey which has changed her physically, emotionally, and mentally. Elena's teaching method came through her own experience, with clear and mindful instructions. She gives her students the opportunity to understand that yoga is an internal awareness that can truly transform their lives. Elena's trading includes: two years T.T. Iyengar Yoga Institute of New York, and two extended trips to India to study with the Iyengar Family. She has been teaching since 2013. Alex Nuzhnov is a former national guardsman who has always had a passion for movement and life. His experiences with physical fitness evolved from personal study and practice of weight lifting to calisthenics, and now encompass a balanced array of functional-type training, with special attention to primal movement patterns. He found Yoga through Amit Kumar by practicing at Sakshi Bhava Yoga Studio, only to realize that this type of philosophy and movement was very much in line with his values, beliefs and life goals. He then went on to register for, and ultimately complete, his Yoga Teaching Certification through Amit's training course in Rishakesh, India in October of 2017. Alex has also accomplished and gained experience by becoming a certified Movnat practitioner (levels 1 & 2), and plans to go forward with training certifications in Animal Flow. His ultimate goal is to expand his growth and business by practicing and teaching the importance of mobility, primal patterns, and functional movement so that he can help and assist with people's goals at various levels of training experience (beginner to advanced.) With an extreme passion and respect for nature, Alex hopes to soon offer his students the opportunity to participate in occasional Primal Flow Movement retreats out in nature for designated dates in the spring and summer months. He is proud and happy to be affiliated with Sakshi Bhava and hopes to share his practice with you! Daria found yoga over 10 years ago as a natural progression from her ballet and modern dance studies. She completed her 200-hour yoga-teacher training at The Bhakti Center in New York in 2016 and has been teaching since then. Training at the Bhakti Center deepened her spiritual practice and made pranayama and meditation a daily practice. She believes regular yoga practice brings powerful shifts in the body, mind, and life of a practitioner. In her classes she is guiding students through sequences with an emphasis on increasing the energy flow and heat in the body through breathing and physical alignment. Her classes create challenging yet nurturing environment that will help practitioners to experience a real change on and off the mat. An eternal student, Daria continues her yoga studies practicing daily and exploring different yoga styles (ashtanga, kundalini, hatha) and their effects on mind, body and soul. Robert is a NYC based yoga instructor from Bensonhurst, Brooklyn. He studied Vinyasa at Yoga to the People in the East Village and started teaching at their New York locations in 2012. Later he picked up Bikram Yoga, a practice he continues to this day in the Lower East Side. He has led large group retreats while living at the Yoga Retreat Center - Song of the Morning - in Northern Michigan. In 2015, Robert participated in a Masters of Yoga Studies Program at Loyola Marymount in Los Angeles. In his free time, Robert enjoys cooking, reading, and nature; especially Brighton Beach. Garrett is a professional dancer, certified Yoga Instructor and personal trainer. He recently relocated to NYC from Miami, FL. He is known for his creative, simple & effective Vinyasa classes that are accessible for everyone. Garrett incorporates Didgeridoo sound healing into his teachings allowing the broad range of harmonics & universal tones form his Didgeridoo to help restore an individual's vibration back to a less chaotic and natural rhythm. He enjoys exploring the power of breath, movement and sound healing in class. Garrett's passion is to provide a meaningful learning experience to all beings who wish to move. Olga Chuglazov is a former downhill skiing expert, who completed a 10 year sports school in Kiev, Ukraine, Olga accepted yoga as a lifestyle after sports related injuries. She got deeper into yoga practice thanks to the inspiration provided by talented teachers at Sakshi Bhava Yoga. Olga appreciates that yoga focuses on mental and physical health by practicing yoga postures with awareness of each muscle used. Mind becomes balanced with proper breathing and relaxation. She completed her RYT 200 Hour Teacher training program at Rishikesh India at the foothills of Himalayas with Yogacharya Amit Kumar. As a yoga teacher she got the opportunity to model a peaceful yoga lifestyle by daily practice. Jeana’s outward venture into yoga started after taking up a suggestion from a friend, but really began as a small child when she would observe bodies in motion and be fascinated by the language they speak. When her own body began to change, she became excited. When her life started to change, she became devoted. Her personal practice led to a profound shift in her understanding of both herself and the world; through self study one could come to a state of health and clarity, and that this experience could be had by anyone. Her desire to heal others led her to complete her teacher certification, and continues to keep her seeking. She is a queens native and has a growing tower of books in her living room related to yoga, body work, spirituality and wellness. Her studies include putting those things into practice with the intelligence of the body through yoga asana. She is a 500 hr RYT, completing her last 300 hrs through the Science of Self training led by Rose Erin Vaughn and Yoshio Hamas. She compliments her understanding of the body through other modalities such as weightlifting and conditioning. She conducts group classes and private sessions that incorporate yoga with body work techniques catered to individual needs. 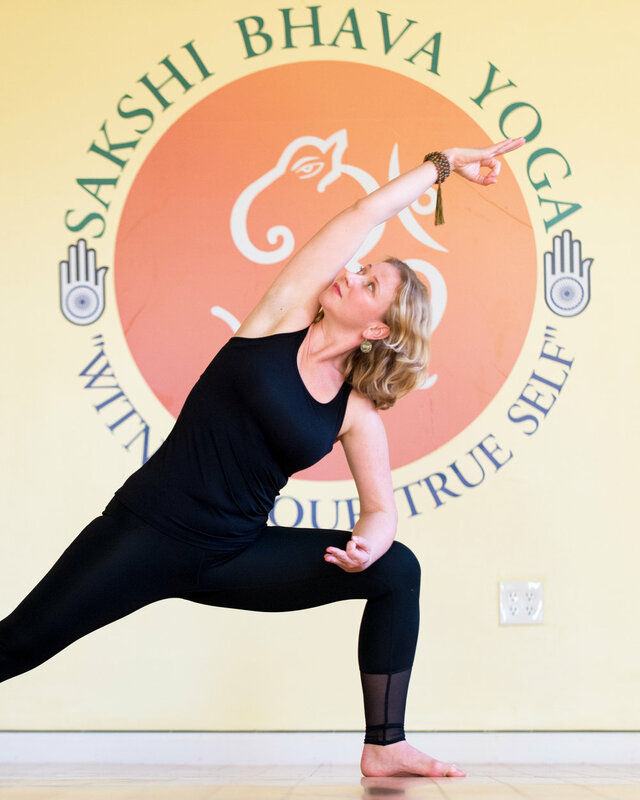 Natasha Shakti Marsch is an Ashtanga and Vinyasa trained Yoga teacher practicing for over 15 years. Natasha is also a Nutrition Health coach working with women and adolescents helping make healthy lifestyle changes while incorporating Yoga as a way of living during private sessions. She received her Yoga teacher training at Ananda Ashram with the famed mentor David Hollander, who is greatly influenced by Shri K .Patthabhi Jois, BNS Iyengar. Natasha’s goal is to create a steady and safe environment where each individual's practice can flower and progress. My main focus and personal interest lies in body alignment and empowerment. In my classes I mix classic asana with any other method I think will help my students understand and improve their postures. My main goal is to get a surprised smile from every yogi when they find extra space in their body or are able to take that extra breath. In 2013 I found yoga after being a gymnast and dancer for 8 years. Before starting yoga I never thought of movement as something spiritual until the mind, body connection started to develop. In 2017 I completed my 200 hour teacher training with Yoga Works. In my personal practice as well as the classes I teach, I am always striving for ways to share with others how they can tap into their truest selves with the help of movement and breath work.